The Galápagos Islands are your ultimate bucket-list destination. The islands are considered a national park, a marine reserve, and a UNESCO World Heritage Site, due to their unparalleled ecosystem and the large number of species not found anywhere else in the world. Rare, singular, and unique are words often used to describe them. But, if you look closely, there are a few places that compare—just on a smaller scale. Mona Island (Isla de Mona) is actually nicknamed the Galápagos of the Caribbean. Though Puerto Rico’s third-largest island, following the main island and Vieques, you’ve probably never heard of it, much less dreamed of visiting. The 14,000-acre island lies in the Mona Passage, in between the west coast of Puerto Rico and the east coast of the Dominican Republic. It was considered an important trading point, slave-boat stop, and smuggling route after Christopher Columbus spotted the island in 1494 and claimed it for Spain. By the end of World War II, it was only used for guano mining, wild boar hunting, and occasional camping. 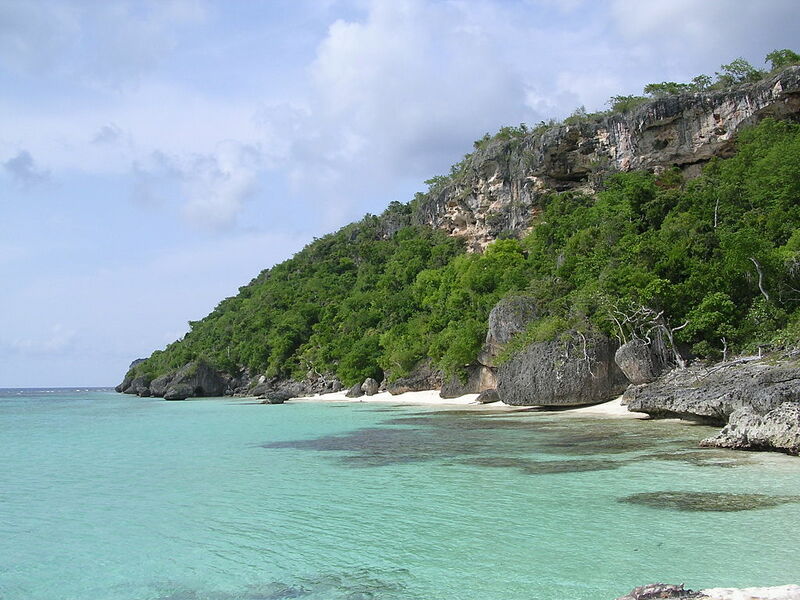 Today the Mona Island Nature Reserve is known as a long day trip for adventure travelers and nature enthusiasts. Boats depart early from Mayagüez to cross the usually rough sea. Most of the limestone island is a flat plateau. Higo chumbo cacti, thorny trees, and poisonous plants cover the island. Cliffs, as high as 200 feet, drop into the sea on the north coast. More than 200 caves are full of Arawak art and carvings by early Spanish explorers. White-sand beaches line the other coasts. There’s an abandoned lighthouse toward the east. A short runway allows for small airplanes dropping off rangers and biologists. Plus a vibrant reef, full of black coral and purple sea fans, lies just beneath the choppy water. But you didn’t come all this way to explore dark caves, a deactivated light, or deserted beaches. You want to see the animals. Luckily, it doesn’t take long. Mona Island is the largest hawksbill sea turtle nesting ground in the Caribbean, and mating season has just begun. Fences surprisingly line Playa Sardinera. They’re due to the feral pigs that eat turtle eggs. The pigs go after the eggs of Mona ground iguanas—Puerto Rico’s largest lizard—as well. They only leave the eggs of red-footed boobies and Mona yellow-shouldered blackbirds alone because they can’t reach them. They don’t mess with the fish-eating bats either. The only creature you prefer not to see is the Mona boa. Though the three-foot snake isn’t venomous, its dark brown markings don’t give off a friendly vibe. But the sea turtles and the iguanas, the boobies and the bats keep you occupied anyway. By the time you’re riding the boat back to the mainland, you’re already planning that long-delayed Galápagos trip. It’s time to start checking things off that bucket list.